The car was a main concern for different reasons. Safety, reliability, comfort and driving ability on dirt roads and under severe climatic conditions. Read very high altitudes, up to 16.000ft and in dry as well as in wet tropic conditions. 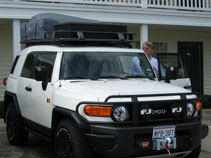 After long searches in Mexico and the US,Dirk found the perfect car: A brand new 4x4 special equipped Toyota FJ Cruiser SE. ........en wanneer we geen democratische slaping vinden wordt het dit. .....and when we wouldn’t find a democratic and acceptable sleeping place we’ll use this kind of equipment. a "front winch" to help us out of difficult situations or to pull away a fallen rock or tree. “bull or brush guard”, you never know where and when an animal will cross our road without warning!